It's the dead of summer, and good TiVo is few and far between. So when I watched the series premiere of Burn Notice, and liked it, I decided that it might be more due to desperation than to the actual quality of the show. But now that I've seen the second episode, "Identity," I've decided that this show has real potential. 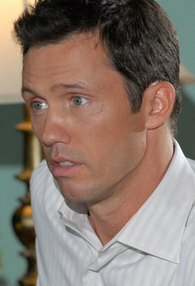 Jeffrey Donovan plays Michael Westen, a former secret agent who has been dumped, fired, decommissioned; in the spy business, apparently, that means you become a non-person, with no money, no identity, no means of earning a living. Donovan, by the way, was born in 1968, which means that he's not quite a Boomer, but also not a Pretty-Baby, either. His manly facial scars make him seem more attractive than if he were completely perfect, I think. Michael, who is stuck in Miami until he figures out who burned him, and why, is in the business of helping old ladies retrieve their savings, and other good deeds. He gives off-camera narration, quite often, on how the spy business operates, and it's rather funny, in a dry kind of way. His former girlfriend, Fiona, is played by Gabrielle Anwar, an oddly-familiar near-anorexic who played Henry's scrawny sister, Princess Margaret, in The Tudors, on Showtime. Here, she's supposed to be a former IRA explosives expert: I'll believe that, right after I believe that George Bush will announce that he made a terrible mistake invading Iraq and will apologize to the American people. "I'm in Miami now, so I can't very well be talking like a friggin' leprechaun, now can I?" delivered in a thick Irish accent. 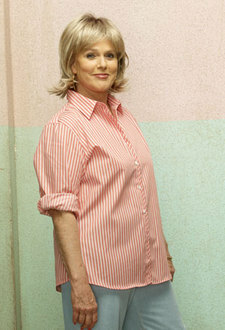 The Boomer redeeming part of the show, centers on Michael's loopy-but-calculating mother, Madeline Westen, played by Sharon Gless. Gless, who was born in 1943, is actually a pre-Boomer, and here she plays a cranky, cigarette-smoking, pushy and unforgiving but loving Mom. Her costumes include really ugly, really gigantic, wacky earrings and tent-like dresses, though her official photos seem to downplay this Miami-grandma look. As an inside joke, Fiona and Sam Axe, Michael's friend, pretend to be Miami cops, and introduce themselves as "Detective Cagney" and "Detective Lacey," which was Gless's role in the 1982 to 1988 television series.